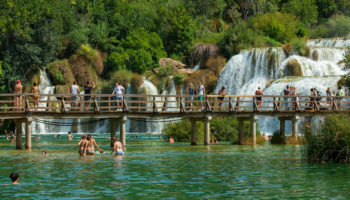 With more than a thousand islands and a deeply indented coast that adds up to 3,600 miles of shoreline, it’s no surprise that Croatia boasts a seemingly countless number of beautiful beaches. 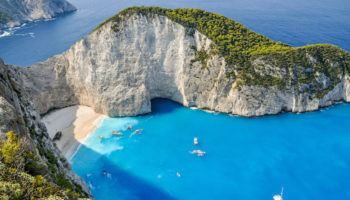 Esteemed for their scenic beauty for centuries, beaches in Croatia have become increasingly popular since the country’s independence, and Croatia’s entrance into the European Union in 2013 means that island-hopping and beach explorations are easier than ever before. While Croatia has some lovely sandy beaches, most are covered with water-smoothed pebbles or gravel. 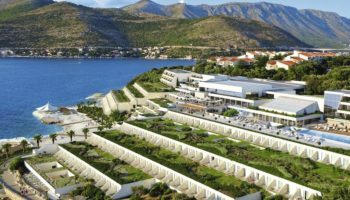 It’s the clear blue, temperate waters of the Adriatic Sea and the awe-inspiring views of the rocky, verdant shores that make the best beaches in Croatia such attractive travel destinations. Long, wide stretches of golden sand are the main attraction of Omis Beach. Located in the seaside town of Omni on the length of coastline known as the Omis Riviera, the beach is dotted with pine and tamarisk trees planted to form a natural promenade. Omis Beach owes its soft sand to the Cetina River, which replenishes the otherwise rocky shoreline with sand each year. The canyons cut by the river through the region’s mountains form a dramatic backdrop for this scenic beach. Located in the extreme south coast of Croatia, Dubrovnik is one the country’s top travel destinations, in part because of the city’s many beaches. Banja Beach, located to the east of the city’s Old Town district, is particularly popular. 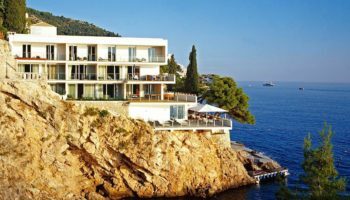 The pebble beach is surrounded by some of Dubrovnik’s best hotels and is equipped with all the amenities that upscale travelers expect, including deck chairs, umbrellas and ranging rooms equipped with showers. The beach favored by celebrities is a great in-town spot to enjoy water sports like jet skiing and paragliding too. 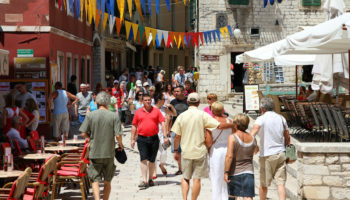 Located on the popular southern coast of Hvar Island, Dubovica is the island’s largest beach. Only a short drive from the town of Milna, the pebble beach is sheltered in an emerald green lagoon set against a small cluster of historic stone houses nestled among rolling hills. Limited parking helps keep this beach from becoming crowded. The calm, crystal clear water invites undersea exploration, making snorkeling is a popular activity. As one of the sunniest spots in Europe, sunbathers flock to Hvar’s picture-perfect beaches as well. Stretching nearly 65 km (40 miles) between the cities of Makarska and Split is the region of the Dalmation Coast known as the Makarska Riviera. Nestled among the foothills of the soaring Mount Biokovo, the town of Makarska features a sheltered bay rimmed with pebbled beaches. The town’s main beach arcs along a promenade shaded by palm trees and bordered by chic cafés, upscale restaurants and shops. The family-friendly beach features peddle-boat and jet-ski rentals for adventurous activities on the sparkling blue sea. Situated on the southwest coast of the Island of Krk, Stara Baska is a small Croatian village situated at the end of the island’s main road. Once known for its locally grown and milled wheat, today, Baska’s major draw is the pebbly beach located around one mile from town. 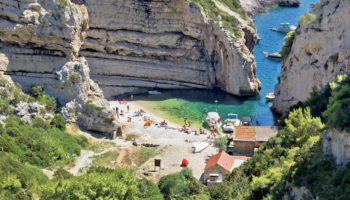 The beach lies in the sheltered cove of Oprna Bay. By foot, the beach is accessed by hiking down a steep path. While there are facilities at the Skrila campsite located above the beach, there’s nothing more than a small bar on the beach itself, so visitors must trek in their own supplies. The beach can also be reached by boat from Stara Baska. Queen’s Beach, or Kraljicina Plaza, is a beach located in the town of Nin in northern Dalmatia. 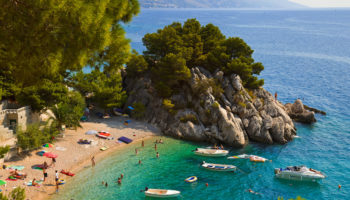 Sandy beaches in Croatia aren’t common along the country’s rocky coastline, and those that stretch for miles are even more rare, which explains the enormous popularity of Queen’s Beach. Another feature that’s made this beach a favorite is the peloid mud found in the shallow areas of Nin’s lagoon. Prized as an effective treatment for sore joints and muscles, people come from all over Europe to slather themselves in mud and relax in the sun. The wind-swept beach is a popular destination for kite and wind surfing as well. Sveti Ivan, or Saint John, is the most famous beach on Cres Island. It’s located at the foot of the picturesque village of Lubenice, an ancient fort city built almost entirely of stone. The beach is a favorite stopping spot for yachts at sea. By land, the beach is accessible only by foot, but the scenic 45-minute descent to the sheltered beach is part of its attraction. Visitors follow red arrows to reach the snow-white pebble beach and crystal-clear water. The climb back up takes around one and a half hours. Located in the small town of Brela around 14 km (9 miles) to the north of Makarska on the Dalmation Coast, Punta Rata is a resort beach that’s valued as much for its amenities and facilities as it is for its picturesque beauty. Surrounded by groves of olive and fig trees, Brela provides a pretty backdrop for this gently sloping beach. Lifeguards, sports facilities and a promenade lined with restaurants and coffee shops make this beach a family favorite, perfect for wading. Located on the Island of Rab at the resort village of Lopar, Rajska Plaza, or Paradise Beach, is one of the most famous beaches in the Adriatic. 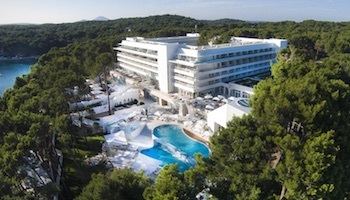 Unlike the clothing-option beaches that have garnered Rab a reputation as an ideal destination for naturists, Rajska Plaza is known as a perfect place to spend a family vacation. Visitors can wade out into the calm and shallow waters for nearly half of a mile without getting their heads wet. It’s also one of the few sandy beaches on Croatia’s rocky islands. 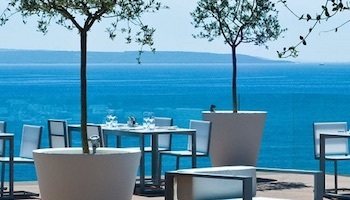 The Island of Brac is best known for the beach Zlatni Rat, which lies on the island’s southern coast to the west of the postcard-pretty town of Bol. Currents in the surrounding Hvar Channel have shaped this one-of-a-kind beach into a narrow, elongated “spit” of land that extends around 450 meters (1,500 feet) into the clear blue sea. Sunbathers on the narrow white pebble beach enjoy views of the sea on both sides. Views of the shore are just as stunning. 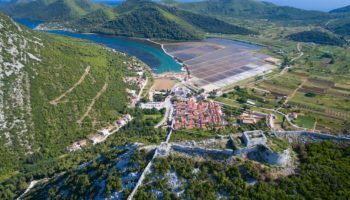 Roman ruins peek out of groves of pine trees set against the soaring beauty of Vidova Mountain, the highest peak in the Adriatic islands. We had a great trip to Makarska. The conditions for paragliding are absolutely world class! Here is a quick video of the fantastic scenery from the air. It is amazing to see such clear water next to the awesome mountains. I do agree with your selections of 10 beaches in Croatia but for those sick of crowded full facilities beaches and looking for some peace and quiet, than Croatia’s secluded beaches are the right place. Just rent a small motor boat or kayak and start for an expedition. I personally adore (you should only know where are they) these secluded beaches. Call them anyway you like, but don’t miss them. They are one of the reason why many come to Croatia year after year.